The Arado Ar 68 was a single-seat biplane fighter developed in the mid-1930s. It was among the first fighters produced when Germany abandoned the restrictions of the Treaty of Versailles and began rearming. Designed to replace the Heinkel He 51, the Ar 68 proved to have admirable handling characteristics on its first flight in early 1934, despite Arado's inability to secure a sufficiently powerful engine for the prototype. Eventually, a Junkers Jumo 210 was installed and the Ar 68 went into production, though not before worries about the unforgiving nature of such a high-performance aircraft almost resulted in the cancellation of the project. The Ar 68 entered service with the Luftwaffe in 1936 and one of the first units was stationed in East Prussia. Soon, the fighter was sent to fight in the Spanish Civil War, where it was outclassed by the stumpy Soviet Polikarpov I-16. Arado responded by upgrading the engine of the Ar-68E, which soon became the Luftwaffe's most widely-used fighter in 1937-8 before being replaced by the Messerschmitt Bf 109. The last Ar 68s served as night fighters in the winter of 1939-40 and fighter-trainers. Ar 68V1 : Prototype, powered by a 492 kW (660 hp) BMW VI engine. 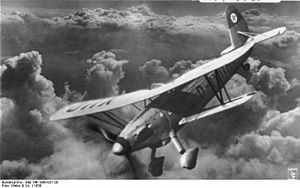 First flight in 1933. Ar 68a : First prototype. Ar 68b : Second prototype. Ar 68c : Third prototype. Ar 68d : Fourth prototype. Ar 68e : Fifth prototype. Ar 68E : First type to enter Luftwaffe service, powered by a 455 kW (610 hp) Junkers Jumo 210. Ar 68F : Powered by a 500 kW (670 hp) BMW VI. Ar 68H : Only a single prototype was built. It was powered by an 634 kW (850 hp) supercharged BMW 132Da nine-cylinder air-cooled radial. It was also the first Arado fighter to have an enclosed cockpit.